QuickBooks has all the tools nonprofits need to succeed. Your business helps others. QuickBooks helps you account for it all. QuickBooks is easy to learn and use. It simplifies the usually complicated accounting tasks that come with running a nonprofit organization. Easily categorize and report on revenue expenditures by fund or program, and create custom reports for each fund or program. QuickBooks is fully customizable for your nonprofit. Create lists of members and donors. Track your budget by programs or funds* so you always know where you stand. As your nonprofit grows, QuickBooks Enterprise NonProfit Edition includes features and functionality to support you. Easily store thousands of donors, vendors, and items, growing your lists without compromising processing time. Plus, you can set individual user permission for more than 115 different activities to further safeguard donor data. Donors. Donations. Dollars. Track it all with QuickBooks. Take donations by credit card, debit card, bank transfer, cash, or check. Employees and volunteers can record donations on their mobile phones. It’s easy to import donation details from tools such as Fundly or DonorPerfect. In just a few clicks, transaction info is synced with QuickBooks. Connect your bank and QuickBooks automatically downloads your transactions, categorizes them for you, and keeps everything updated. Focus on your mission. We’ll help with the reporting. If your nonprofit reports to the IRS, we have you covered. Tag expenses to fundraising, programs, general, or administrative throughout the year so you’re ready for tax time. QuickBooks can instantly create any type of report you need. Keep everyone in the loop with custom board member, donor, and grant reports. Set up automatic reports to be created and emailed to your team such as a Statement of Financial Position, Statement of Financial Activities, Budget vs. Actual, and more. 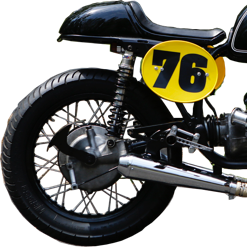 Jeremy Malman founded Worth Motorcycles to teach at-risk youth to build vintage bikes. But the Brooklyn-based non-profit’s real mission is to build the idea that with hard work, you can succeed. Perfect for the fundraiser on the go. Access your constituent contacts, enter donations, review activities, membership, events, and store purchases right from your phone. DonorPath matches you to a virtual fundraising coach with a simple, elegant dashboard to identify new opportunities, automate reports, and see donor wealth scores. Kindful offers fundraising automation, online donation pages, donor CRM, and reporting tools—all aimed at helping nonprofit organizations fundraise effectively. QuickBooks makes it easy to track your donors and donations. Send financial reports and updates to donors so they know how you’re utilizing the money. What is fund accounting and how does QuickBooks help? Fund accounting means tracking expenses by fund or program. Nonprofit organizations track how money is spent, rather than how much profit is earned. QuickBooks makes it easy to allocate revenue and expenditures to specific funds or programs. You can instantly create financial reports to see where you stand. QuickBooks automatically allocates overhead to programs, fundraising, general, and administrative expenses for you. We use volunteers to help with our accounting. How easy is it for volunteers to work with QuickBooks? Many nonprofit organizations rely on volunteers to help with their accounting. That’s why we’ve made QuickBooks easy to learn and to use. Create unique user IDs for volunteers and assign access levels for each. And because it’s online, volunteers can help from anywhere, anytime! QuickBooks does a lot of the work automatically, saving you and your volunteers precious time. Connect your bank account and QuickBooks will learn to categorize expenses for you. Set reports to be automatically created and emailed to board or committee members on any schedule you’d like. How can QuickBooks help us accept and properly track donations? QuickBooks lets you accept all types of donations. You and your volunteers can accept donations from a credit card, debit card, bank transfer, cash, or check. Your team can take and record donations right on their phone. Tag donations to a specific program or fund for accurate bookkeeping. How can QuickBooks help me produce reports to share with the board, my colleagues, or donors? Nonprofits use a variety of specialized reports such as annual board member reports, donor reports, and grant reports. With QuickBooks, you can easily customize your reporting templates and run any report you need. Create presentation-worty reports with your logo, an introduction, and notes. Set up automatic reports to be created and emailed to colleagues, board members, and donors. Instantly review the Statement of Financial Position, the Statement of Financial Activities to Budget, actual reports, and more. * Send your donors yearly donation statement with thank you letters attached. My nonprofit has to file IRS Form 990 every year. Can QuickBooks help? Not all nonprofits need to report to the IRS, but the ones that do need to report where the money came from, how it was spent, and why it was spent. QuickBooks makes it easy to tag expenditures to fundraising, programs, or general & admin so that you can report exactly how each dollar was spent for each program or fund across your organization. At the end of the year, all of your data is organized in one location to save you time when preparing IRS Form 990. Does QuickBooks offer a discount for nonprofit organizations? Yes! QuickBooks offers discounted products for nonprofits through TechSoup, a nonprofit tech marketplace. We recommend that nonprofits use QuickBooks Online Plus so they can get all the tools, tracking, and reporting features we offer. Join over 12,000 nonprofits globally.